Line from the film: "Look, I'm nobody's favorite"
The above quote comes courtesy of the lead character in The Loneliness of the Long Distance Runner, a 1962 movie that, like Saturday Night and Sunday Morning before it, is considered part of the British New Wave movement that stretched from 1959 to 1963. But in addition to the realism that helped define this particular era of UK filmmaking, director Tony Richardson also tosses a few cinematic bells and whistles into the mix, which he uses to enhance the movie’s central theme of isolation while also kicking the energy level up a notch. After stealing money from a local bakery, Colin Smith (Tom Courtenay) is sent to Ruxton Towers, a youth detention center. Though something of a loner, Colin soon impresses the facility’s Governor (played by Michael Redgrave) with his athletic prowess. Seeing him as Ruxton’s best chance to win the Challenge Cup in the long-distance race against Renley (a nearby boarding school that caters to the upper-class), the Governor orders that Colin be given special privileges. Naturally, this doesn’t sit well with his fellow inmates, especially Stacey (Philip Martin), the Governor’s previous favorite. But the question remains: has the rebellious Colin actually changed his ways, or is he simply biding his time? 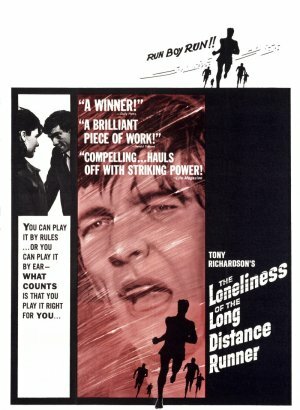 The Loneliness of the Long Distance Runner marked the big-screen debut of actor Tom Courtenay, who, like Albert Finney in Saturday Night and Sunday Morning, makes for a convincing angry young man, disillusioned with the world around him and looking for a way out of it. Though definitely strong in those scenes set in Ruxton, where Colin’s increasingly cordial relationship with the Governor makes him something of an outcast among his peers, Courtenay really shines during the movie’s “flashback” sequences, moments where we’re shown his unhappy home life (following his father’s death, Colin’s mother, played by Avis Bunnage, went on a shopping spree with the $500 she got from her husband’s insurance policy) as well as his budding relationship with Audrey (Topsy Jane), who was as anxious as Colin to escape her lower-class lifestyle. These glimpses into the recent past reveal a lot about Colin, and Courtenay’s often understated approach to the role proved just enough to gain our sympathy, yet also made Colin something of an enigma, a young man we can relate to even when we’re not sure what’s really on his mind. Much like Karel Reisz did with Saturday Night and Sunday Morning, Richardson shot The Loneliness of the Long Distance Runner entirely on-location, giving the film a realistic vibe. But it’s those moments where the director allows his creative juices to flow that really stand out. During a “flashback” scene in which Colin and his pal Mike (James Bolam) steal a car, the action speeds up, as if it was lifted straight out of a Mack Sennett/ Keystone Kops comedy short; and an early practice race at Ruxton is presented almost entirely in POV, from Colin’s perspective (we watch as he catches up to, then passes an obviously frustrated Stacey). With its working-class mentality and cinema verite style, The Loneliness of the Long Distance Runner still comes across as very realistic, but it’s the added flare that Tony Richardson provides from time to time that makes it special.